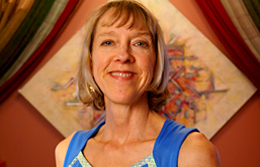 Robin has been practicing yoga for 30 years and has worked as a Massage Therapist for 23 years. She combines yoga and massage principals to help her students come into balance with breath, body, and soul awareness. She approaches yoga with curiosity, safety and alignment based postures. Her intention is to deepen self awareness and be present to what IS. Releasing what does not serve us and what we are ready to let go of through intention and the breath. Her love of yoga is in using the practice as an avenue to move forward in a more positive, holistic way.